A LeadUp Teacher undoubtedly possesses many characteristics! Innovative, inspiring, and empowering just to name a few. What would you add to these 10 Defining Characteristics of a LeadUp Teacher? A LeadUp Teacher is adept at asking questions. What is…, how does it work, is there another way, what about this, why… and so on. This teacher asks these questions of both others and themselves on a regular basis. Never content with answers that take on a, “This is how it has always been done.” flavor. The LeadUp Teacher knows that questioning the status quo is their responsibility and others actually expect them to push the envelope with their questions. LeadUp Teachers recognize how to relate to colleagues in all positions, and they devote quality time to listening with understanding to their needs and concerns. They are cognizant of what others value and are continually learning about those they work with in order to lead effectively. When we identify the strengths of those around us, we can uplift and encourage our team members to step forward. As we add value to individuals, areas of growth further develop and begin to strengthen due to trusting relationships, support, and encouragement. 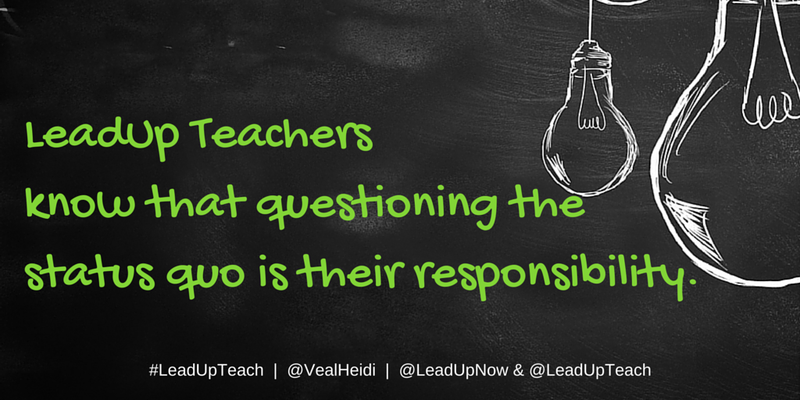 LeadUp Teachers are aware of the impact they have when they intentionally add value to colleagues. When teachers feel celebrated they recognize that their strengths contribute to the greater good and are motivated to make more of an impact. LeadUp Teachers understand that it’s not solely the principal’s role to celebrate the accomplishments of others, but grasp that as a collaborative team we share this responsibility. The LeadUp Teacher empowers colleagues by modeling risk taking, sharing, and being transparent about both successes and failures. By being willing to take the fall and share about experiences, colleagues feel a sense of security which in turn promotes them to take risks as well. Leadup teachers verbalize their belief in their colleagues and act as a support system that provides genuine encouragement. Deliberate reflection turns experiences into an opportunity for growth. 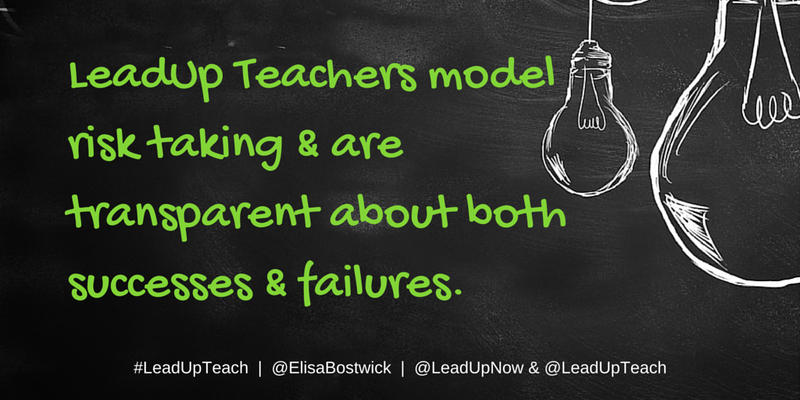 LeadUp teachers understand that they need to look back to move forward. They reflect by uncovering both their successes and failures in order to retool their practice. Reflection that is transparent promotes the growth of both individuals and teams as teachers share what they learned, and how they will proceed forward in the future. Leadup Teachers embrace a growth mindset and the idea that every opportunity around us, provides an opportunity to learn. 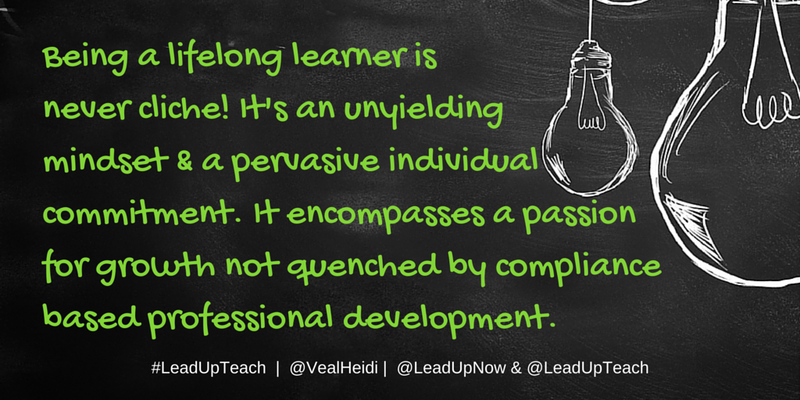 The LeadUp Teacher doesn’t depend on others to grow or challenge them. They view professional development as a lifestyle, not an event and are always on the lookout for opportunities to learn more, do more, and be more because they know their continual growth is a critical factor to their students’ growth over time. Being a lifelong learner is never cliché for the LeadUp Teacher, but rather is their unyielding mindset, the pervasive culture in their classroom, and encompasses a passion not quenched by compliance based professional development. George Couros explained, “To truly integrate new learning, it is critical to carve out time for exploration, collaboration, and reflection to allow educators to apply what they are learning.” This is what a LeadUp Teacher does in all areas of their life. The LeadUp Teacher often serves as a catalysts for innovation as they see a variety of possibilities on how to craft diverse and unique learning opportunities that richly benefit students, and their school community. As connected educators who embrace learning from fellow educators in a variety of positions, the LeadUp Teacher is able to gain a unique perspective on shifts taking place in schools globally. LeadUp Teachers are fearless in the pursuit of what’s best for students and their school community. With a tendency to be visionary, the LeadUp Teacher identifies how they are a key player in fostering systemic change through cultivating shifts that impact school culture, instructional strategy, and ultimately student learning. Cultivating change and being a risk taker in education requires boldness. The LeadUp Teacher exhibits courage, finesse, and demonstrates a solid voice when it comes to advocating for improved practices and authentic learning opportunities for students. Before making decisions, a LeadUp Teacher always considers the impact on the whole child. When educators collaborate with an all hands on deck approach, they empower one another to demonstrate courage and share their voice. 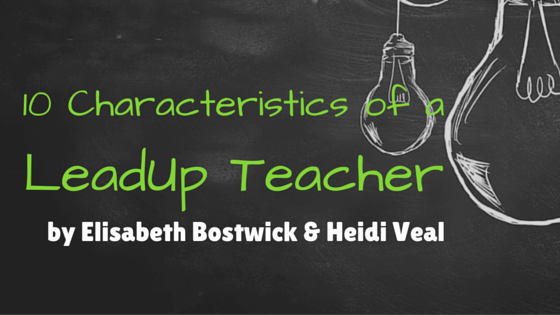 LeadUp Teachers are “fearless in the pursuit of what sets their soul on fire” -Jennifer Lee. They exude passion for their priorities which always center on PEOPLE first! They commit to inspiring everyone in their sphere of influence, first and foremost their students, colleagues, and families. They see what they do as both significant and life altering. Their passion to LeadUp is not accidental or random, but a calling that drives an unwavering, unending commitment to excellence! Doing what’s best for students is the only way a Lead Up Teacher knows how to work. Their purpose is to make the world a better place one student at a time, one day at a time. 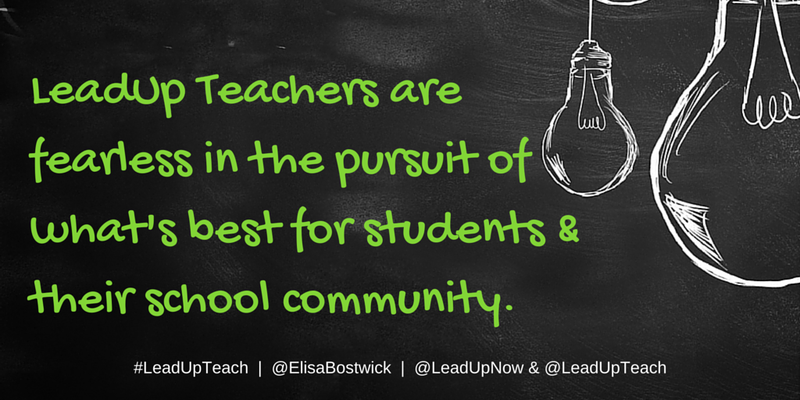 Students are at the center of their purpose, passion, decisions, and classroom. They put the needs of their students ahead of their own comfort zones, expectations, and even plans. Students are the focus of the classroom and student learning takes center stage, priority #1. Each day we’re provided a new opportunity to make a difference in the lives of students and within our school community. Embracing the characteristics of a LeadUp Teacher has the potential to inspire passion to ignite within others, which empowers them to put forth their best. In this movement, how will you be an influencer who embraces the characteristics of a Leadup Teacher and sparks the spirit within others?